The UDS/Motorola modem is back in production again as the Telenetics MOT202T modems - desk tops, DC power and rack cards - now you can plan for future networks using the 202T modems. Telenetics introduces the latest addition to the family of industrial grade, temperature hardened Modems, Model MOT202T. This 0-1800 bps leased telecom line or private wire modem is a pin-for-pin, form, fit and function replacement for Motorola Model RM16M. Telenetics recently signed a manufacturing license and distribution agreement with Motorola and acquired the remaining products of this bellwether modem. You may also want to consider pre-owned communications gear! The UDS 202T modem features built-in diagnostic and anti-streaming capabilities. The anti-streaming capability prevents a modem from remaining in the transmit mode when the modem is not actively transmitting data. The diagnostic features allow the user to verify transmitted and received data. The specific features are. The Universal Data Systems 202T is a Frequency Shift Keyed (FSK) modem which is designed for asynchronous operation at 0 to 1800 bps with C2 line conditioning, or 0 to 1200 bps asynchronous operation on unconditioned lines. The modem provides half duplex communications on 2 wire private lines or full duplex communications on 4 wire private lines, and is ideal for use in multipoint networks. The 202T is a single printed circuit card enclosed in a new compact size housing. The unit features an integral anti-streaming protection option which prevents network Tie-ups by incorporating a delay timer that will disconnect a modem, if it remains in transmit mode longer than a selectable period of time. The 202T also features strap options for Request to-Send/Clear to Send Delay timing, Transmit Carrier, local Copy Squelch, Turnaround squelch, Soft Carrier Turn Off, Carrier Detect Level, Carrier Detect Delay, and Test Generator Baud Rate Select. These strap options allow the user greater control of the modem, for his individual application. The UDS 202T standalone modem is designed to be interchangeable between the Universal Data Shelf multiple modem enclosure and the stand alone modem enclosure. 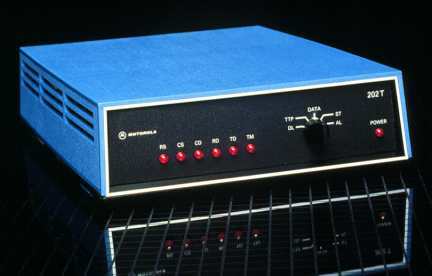 By removing the modem card and attaching the optional front panel, the modem can be directly inserted into the Universal Data Shelf. With this feature, a data-communications facility can be easily upgrade front multiple standalone enclosures to a centralized rack without the expense and trouble of purchasing new modems. Additionally a single 202T may be mounted in a standard 19" equipment rack via the UDS models RM16M Model 1 through model 29. Mechanical: Width: 7"; Height 2.25"; Depth: 9.60"; Weight 3.0 Lbs. DL (Digital Loopback); When the switch is in the ST position, the received data is looped back into the transmitter and the data is transmitted to the remote end. The modem must be in the 4 wire mode. TTP (Transmit Test Pattern): When the switch is in the TTP position, the transmitter is forced ON and transmits the date from the dot pattern generator to the COMM Line. The RS-232 interface lines to the transmitter are not active (RS, CS, TD). CD (Carrier Detect): ON when a carrier is detected by the modem receiver. RD (Receive Data): On when data is received, decoded, and furnished to the terminal equipment. RD is also ON when the receive cats line goes into a space condition, OFF in a mark condition. TD (Transmit Data): Responds in the same manner as the RD LED, but only when data to be "transmitted" is furnished to the modem. However, the LED may be on when the DTE is disconnected. POWER: ON when power is applied to the modem.